With all these pressures, many airports have seen PRM volumes double in the last 8 years and they are likely to double again by 2020. There comes a point when manual copying of PAL/CAL notifications and recordings of service delivery times just won’t cope. Such systems are labour intensive, expensive, and can lead to crucial error – leaving your airport at serious risk to lapses in PRM assistance, regulatory investigation/fines and unwanted media attention. With this accurate data you can focus on solving the problems not arguing over the numbers or who to blame. Our modular approach offers three levels of PRM management, enabling you to choose the right package for your airport’s needs – today and in the future. Within the space of a few days, your airport could have its PAL/CAL notifications processed and verified automatically by our systems – drastically improving data accuracy. 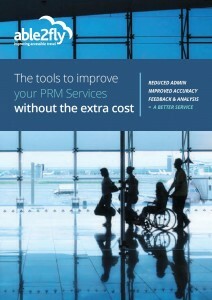 The complete PRM management solution has been designed to be used as a standalone tool, but can be directly integrated into your airports systems. It has been designed to work with IATA standard messaging and we work with your PRM service providers before problems arise.